New Mexico State University’s range scientists, media development team and the Tri-State Navajo Nation Extension professionals worked together to develop a Navajo/English mobile-accessible tool and agricultural professional support system to help Navajo range managers sustain the future of their Navajo rangelands. This integrated program addresses specific management needs identified by Navajo producers and supports interpretation and documentation of vegetation and range conditions. 1. Developing innovative mobile-accessible tools that allow professionals and producers to access information on effective rangeland management methods while out on the range. The tools include written and spoken Navajo plant names and support interpretation of range conditions and encourages photo documentation of vegetation and range conditions. It will help create a forum for Navajo agricultural professionals, ranchers and farmers to gather and share current data with other agricultural professionals and producers. a. Project team members will confer with Extension rangeland experts in the region and use existing resources to draw content to use in the tool and ensure it provides updated information. b. Navajo Extension professionals will be involved throughout the process to ensure information is correct and effective for their target audience. 2. Training Navajo agricultural professionals on how to effectively educate Navajo producers about improving rangeland management and sustainability methods through use of the tool. 3. Implementing the tool in the field, thus increasing agricultural professionals’ knowledge and confidence by providing “any time, anywhere” accessibility of information on mobile devices with specific content related to sustainable rangeland management on the Navajo reservation. New Mexico State University’s range scientists, innovative media development team and Navajo Tri-State Federally Recognized Tribal Extension Program professionals have worked together to develop an interactive Navajo/English web tool, downloadable version for offline use, and agricultural professional support system to help Navajo range managers sustain the future of their Navajo rangelands. It addresses specific management needs identified by Navajo producers and supports Navajo language speakers by providing written and spoken Navajo plant names, as well as encouraging photo documentation of vegetation and range conditions. During 2017-2018, NMSU Innovative Media Research and Extension (formerly Media Productions) finalized content material, mobile-accessible web database and webpage, and downloadable version for offline use. 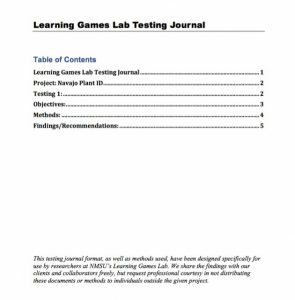 The present version of the product, accessible at http://navajorange.nmsu.edu, reflects changes and re-direction resulting from lessons learning during successive rounds of user-testing and review by stakeholders. 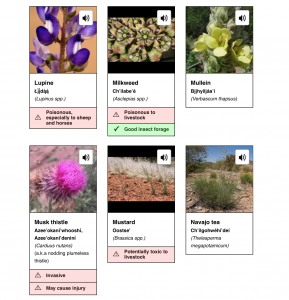 During winter/spring 2016, NMSU Media Productions created a prototype for delivery of the content material via mobile device, and tested its functionality and design using the Navajo Range Plant database (prototype developed during Fall, 2015). The present version of the product, accessible at http://navajorange.nmsu.edu, reflects changes and re-direction resulting from lessons learning during user-testing of the prototype. See objectives listed below project summary in main report page. Gerald Moore, Coordinating Extension Agent of Navajo Tri-State Federally Recognized Tribal Extension Program, has presented the rangeland plants tools from this project to groups of stakeholders. These include: elected Farm Board Officials who represent the major farms through the Navajo Nation; Navajo agency professionals (including from BIA, NRCS, Navajo Department of Agriculture, and Navajo Soil and Water Conservation District); and educators (including from Diné College). Upcoming groups include Eastern Navajo Agency Ranchers–NM and Navajo Nation Grazing Committee Officials. Preliminary research suggests positive outcomes and impacts of the Selected Plants of Navajo Rangelands tool (http://NavajoRange.NMSU.edu). Among 25 agricultural leaders surveyed, 92% felt that the resources would be used on the Navajo Nation. Respondents cited images, written Navajo, and spoken Navajo as the most useful aspects of the tool. Although a majority of respondents stated that they themselves used English names for plants, 40% also or primarily used Navajo names, with four respondents (16%) also using scientific names and one respondent (4%) using Hopi names. 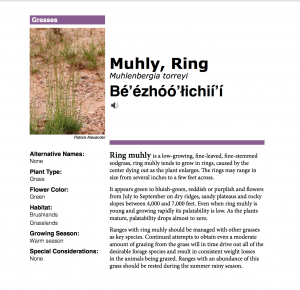 Respondents primarily anticipated using the guide to learn Navajo names of plants (moreso than pronunciations), which suggests that a printed version of the guide would also be of use. Respondents felt the guide would be used by their friends, children, teachers, parents, and grandparents, with more than half of respondents specifying its usefulness to children. 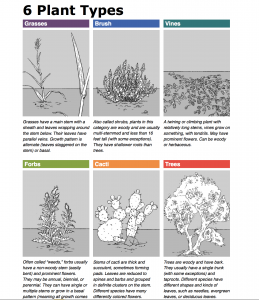 Nearly all respondents (92%) agreed that this guide would help the next generation and that it would support healthy rangeland management. 3 User testing and review by stakeholders. 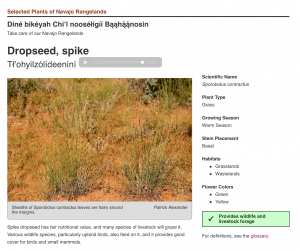 The Selected Plant of Navajo Rangelands webpage presents a searchable database of 198 rangeland plants found on the Navajo Nation, including both native, beneficial plants and noxious/invasive plants. 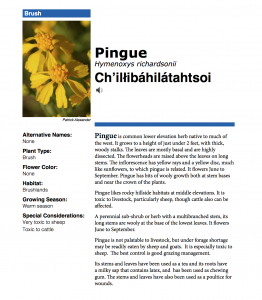 When the user selects a plant they can view images of that plant, read and hear its Navajo name, and learn about its role in rangelands, including special concerns such as noxious status or risk of livestock poisoning. 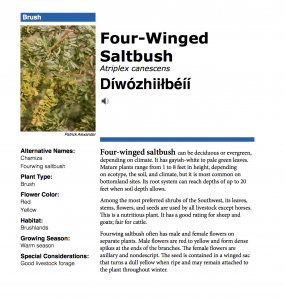 Each plant entry includes the searchable categories plant type, growing season, scientific and alternate names, flower color, rangeland warnings, and (for most plants) written and spoken Navajo. 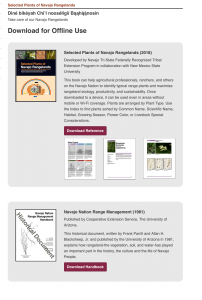 Search functionality of the Navajo rangeland plants tool. Search results showing an example of a search for forbs found on the Navajo Nation, including their Navajo names and their key range characteristics. 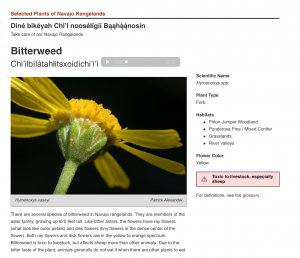 First page of web database entry for bitterweed. First page of web database entry for cliffrose. First page of web database entry for spike dropseed. Download page showing resources available for offline use, including 350-page printable version of the online database. Entry for the toxic forb pingue, from the downloadable version for offline use. Navajo rangeland managers, working through Gerald Moore of the Tri-State Navajo Nation Extension unit, were involved in project development, and in providing feedback on prototypes development in conjunction with NMSU scientists and the development team. Navajo agency professionals have also been involved throughout the process to ensure information is correct and effective for their target audience. In Fall 2016, after visiting Window Rock, NM for user testing, the team received ongoing contributions of images, information, and advice from agency personnel and others who forged connections to the project during testing. During user testing with Navajo range managers in Window Rock, NM, development team members observed, recorded, and analyzed responses from participants and produced a 12-page user-testing journal describing these findings. Rangeland plant information was gathered in collaboration with Gerald Moore (Navajo Nation Tri-State FRTEP Program) and Nick Ashcroft (Extension Range Specialist, NMSU) and includes photos, descriptions, plant IDs, and localized information gathered from the USDA PLANTS database, BLM botanists, NRCS specialists, BIA specialists, Navajo Department of Agriculture specialists, and online resources provided, with permission, by Western NM State University, Utah State Extension, and the University of Arizona. Gerald Moore, along with a Navajo language specialist, delivered a large number of Navajo language audio and text files to NMSU. Gerald Moore has also worked with a Navajo language specialist regarding best practices for Navajo font use on mobile devices and computers. 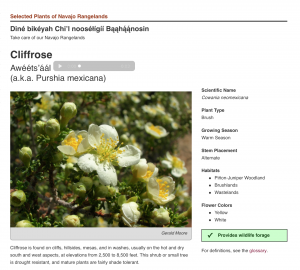 In 2017-2018, the NMSU team was able to update the Navajo text for plant names to a generally readable font that can be copied/pasted from a web browser, allowing greater flexibility for users. Navajo rangeland managers, working through Gerald Moore and the Tri-State Navajo Nation Extension unit, were involved in project development, and in providing feedback on prototypes development in conjunction with NMSU scientists and the app development team. Navajo agency professionals have also been involved throughout the process to ensure information is correct and effective for their target audience. The NMSU team and Gerald Moore met in January, February, and March 2018 to review the tool, finalize changes and corrections, and plan for future distribution. Gerald Moore is continuing distribution and field-testing of the tool on the Navajo Nation. He has distributed the tool to elected Farm Board Officials who represent the major farms through the Navajo Nation and plans to distribute it to elected officials who represent Eastern Navajo Agency ranchers in New Mexico and the Navajo Nation Grazing Committee, who represent Navajo Nation ranchers on the Arizona side of the Navajo Nation. A 350-page downloadable version of the online database information is also available, to enable offline use. 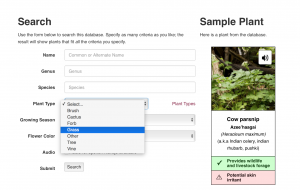 In both the web database and downloadable version, plants are sorted by plant type to enable easy searching.